Everyone loves a good party! Some people totally love to have a theme party. It seems like themed parties are the new trend and they are huge hit. Some can be over-the-top and some can be smaller yet totally done right! 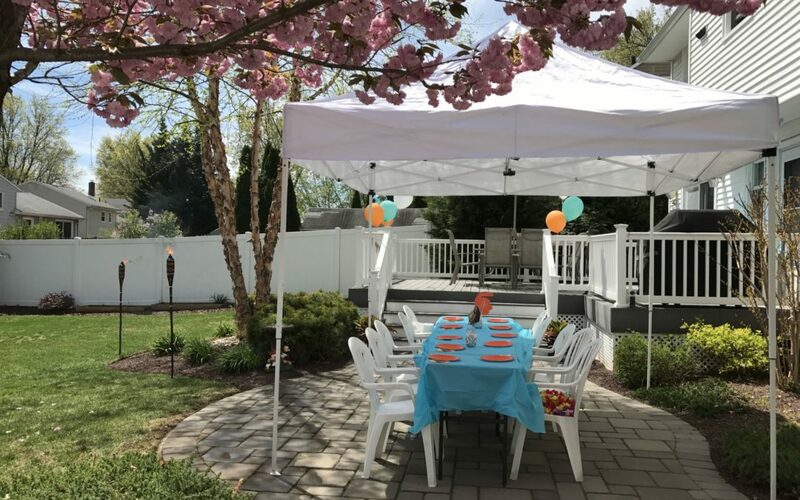 Parties can be done perfectly with just a small amount of items. 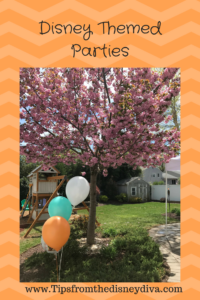 I have two young girls and I love party planning. I try to gear everything towards Disney when i can or when appropriate. For as much as I love Disney I am not a “cartoon-disney like” party person. Now, I hope that makes sense to you! What I mean by “cartoon-like” is that I don’t like everything such as your typical Minnie Mouse or Mickey Mouse cartoon decorations. Whenever I do a Disney themed party I like to incorporate certain patterns that match characters or colors. I am bigger on silhouettes or something that is a generic theme yet able to have a Disney touch or twist added to it. For decorations I chose more of luau type theme. I chose a lot of decorations that had hibiscus flowers on them. My daughter did want Moana character plates and cups for the kids so that’s what I did for them. 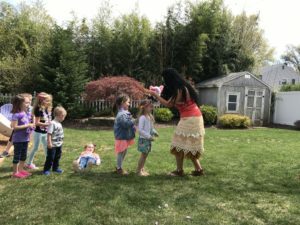 The rest of the party supplies or more brightly colored and also match the colors of Moana. For balloons I chose one foil character balloon and chose a bunch of latex balloons to match. 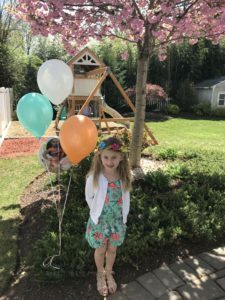 We did aqua, orange and white balloons to go with the character balloon in bunches throughout my backyard. Most of the party supplies came from my local Party City store. I also ordered a cute character Moana banner from Etsy. Since young children always seem to waste cake and only eat the icing, I went to my local supermarket and had them make me a brightly colored cupcakes that matched the themed colors. I ordered multiple Moana plastic rings and I placed them on top as cupcake toppers. The kids were also able to keep these and throw them in their goody bags when they left the party. Now, what would be better than having the Wayfinder princess come to your party?!?! 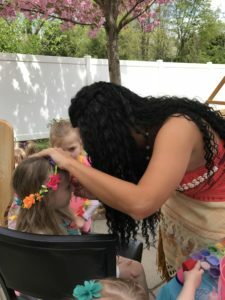 I knew of a local woman who has a princess business for parties, Fairytale Fantasy Princess Parties I decided to reach out to her for availability and packages. I found her to be extremely reasonable. I live in New Jersey and her business is not far from me. She has many princesses to choose from and they are all beautiful! I was able to book her a few months in advance and was able to get the date and time that I wanted with only giving her a small deposit. 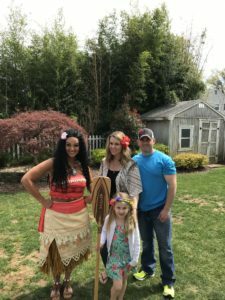 I was able to have the Wayfinder princess come to my house and surprise my daughter! I was able to meet her in the front of my house when she arrived and I walked her inside since everyone was in my backyard. We decided to have her walk onto my deck down by all the children and surprise my daughter. All of the kids went crazy when they saw the Wayfinder princess make an appearance right in front of them! I chose a smaller package because I had a smaller party. She played a few games with them in my yard which kept them all entertained. She also did face painting of the children’s choice which they absolutely loved! She brought a special flower crown for my daughter for her birthday and my daughter went wild over that. 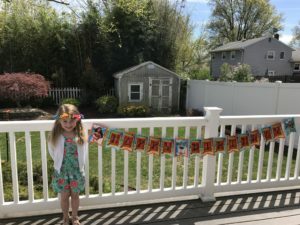 She still has it to this day and talks about her birthday party when her favorite Wayfinder princess came to her house for her birthday party! Looking for an easy DIY Moana Cake, see Pink Diva’s article on how to make one of your own here. 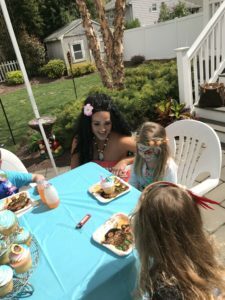 If you live in New Jersey and are looking to have a princess party I would definitely reach out to her. She has so many packages of all different prices which are affordable for everyone! You can give that special princess in your life a perfect princess party without having to leave home!